Chris Jones — Esquire’s Chris Jones — had a great post on his Son of Bold Venture about the Lara Logan story and the inherent dangers of journalism. There is a form of math involved in decisions involving certain kinds of stories. Lara Logan should not be condemned, she certainly should not be blamed for becoming a victim in Cairo. She’s an experienced international reporter who’s done dangerous stories before. There were dozens, probably hundreds, of other journalists in that square. Somehow she was spun into a vortex of bad people. The math can go bad driving to a city council meeting, just as it can in the middle of a revolution halfway around the world. That’s in the macro. The micro decisions during the actual reporting are even further removed. A classroom discussion can never measure how anxious you become hearing reports of terrible things come in over the radio, wanting to get out there and see it. It can’t factor in how bored you might be after waiting for the worst of the storm to pass. It can’t account for the adrenaline rush you might get in the middle of a debris-filled road with shingles flying around your head. Substitute a chat over beers for a classroom setting, and the math gets further scrambled. Alcohol + testosterone = strong, brave reporter talk. I remember being really jealous that fellow reporter Patrick Peterson got to embed during the Second Gulf War. Without being tapped to actually go and do it, it was just a hypothetical for me. Patrick got to go, and did a great job. He also had to make that decision knowing he was leaving a teenage daughter back in the States. Again, I have no idea the math he had to do to make that decision. I’ve done some things that might make folks wonder about my risk-math skills. Serve on a nuclear submarine. Questionable. Run to where I assumed there was flooding after a bump with another submarine. More questionable. 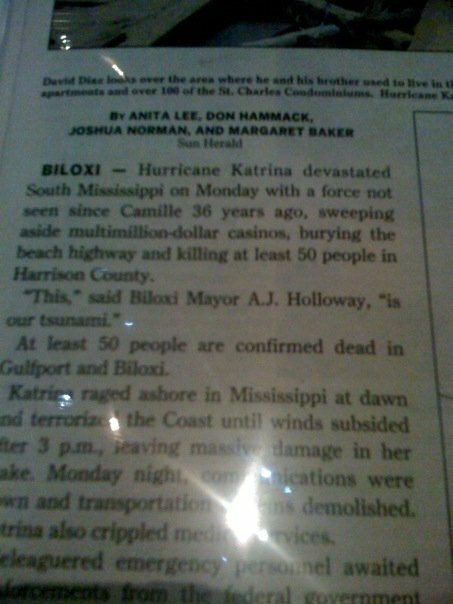 Stay in Gulfport for Hurricane Katrina’s landfall. Not smart. Hunker down with county emergency management officials in the courthouse. Smarter. Leave the courthouse while the storm is still blowing around. Probably really dumb. Journalism has to hope that there are people just dumb enough to make those decisions, but just smart enough to pull them off. That there are people brave enough to go into those place, but cowardly enough not to blindly run down a literal dead-end on the decision tree. People might be tempted to say that going to report on a story is only worth it if you make it back to write it. Truth is, math doesn’t work that way.